While some of the better-known poisonous plants are perennials such as foxglove (Digitalis spp.) and annuals (in the North) such as castor bean (Ricinus communis), there are also a number of shrubs that bear poisonous berries, seeds, or leaves. Many of these bushes are so commonly grown that, even if we have learned of their toxicity, it is easy for us to let our guard down around them. But when you have to decide whether or not to grow poisonous shrubs, it is best always to err on the side of caution, especially if you have small children. It is also a concern when you have pets. Dogs are rambunctious and tend to sample plants freely, so you should steer clear of growing plants that are poisonous to dogs. But even our more restrained feline friends will try to eat plant material, some of which is poisonous for them. For example, azalea shrubs are toxic to cats. Sometimes, just one part of a plant will be toxic. 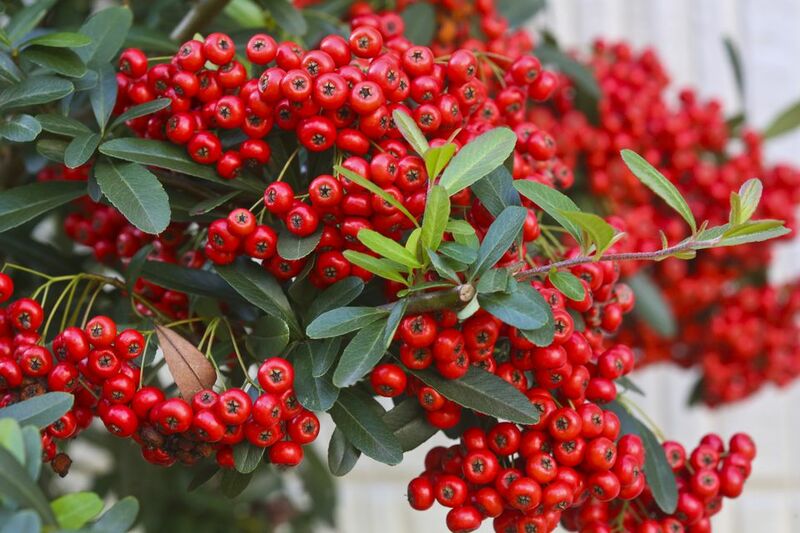 Some bushes bear poisonous berries or seeds, while, with others, it may be toxic leaves (or roots, stems, bark, or flowers) that present a danger. Still, other shrubs may have multiple poisonous parts or be toxic all over. Pokeweed is included because it is classified by botanists as a shrub and because it is very commonly found in the yard. It is a wild plant, not a landscape shrub. Nonetheless, its poisonous nature is something to keep in mind, because children are very much attracted to its colorful berries. The toxicity of yew is tricky to discuss. Technically, it is only the seed that is toxic: The flesh, itself of the red berry (actually classified as an "aril") is not. But any berries with toxic seeds are essentially "poisonous berries," since eating the berries means exposing yourself to the seeds. Mountain laurel is related to the wild bush named "lambkill" that is notorious for being poisonous. Both, in turn, are related to Andromeda, azalea, and rhododendron shrubs. Gardeners who live in cold climates may think of lantana as a plant grown in hanging pots, but, in warm regions, it grows as a shrub. A few other kinds of shrubs are problematic to our health, but not necessarily because they might be eaten by accident. Everyone has heard of the poisonous shrubs, poison sumac (Rhus vernix) and poison oak (Rhus diversilobum). They are examples of bushes that we try to avoid brushing up against our skin because they can cause nasty rashes. They are wild plants, but poison oak may very well be growing in your yard, depending on the region in which you live. Another special case is presented by poinsettia plants (Euphorbia pulcherrima). People with latex allergies can become sick just by being in the same room with a poinsettia shrub (they do not even have to touch it to experience the ill effects). The leaves are a skin irritant for some people. The vine bears poisonous berries. Likewise, trumpet vine is poisonous whether you eat it or (for some people) touch it.